Get bent, Dracula. We have garlic. Ironically, the best time to plant your garlic is just shy of two weeks of Halloween – in other words, right now! I have no idea if this very precise and specifically planned gardening ritual has anything to do with the many myths and legends of garlic warding off vampires, but I do know that year after year, my family plants literally hundreds of garlic bulbs so that throughout the year, we are never without. 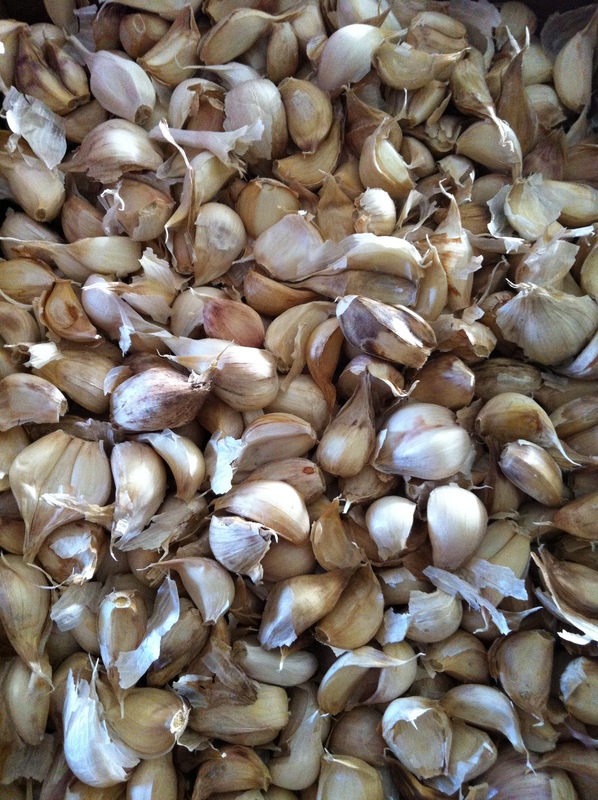 You’re first question might be, “Well, what do I plant?” Get this – you plant cloves of garlic from the year’s harvest. Here in Pennsylvania, garlic is ready around July – we pick them, braid them, hang them, and then cook with them constantly. From the July harvest, we reserve enough garlic heads to plant approximately 500 cloves in the garden – they are ready to be planted around this time of year. I am not sure about the science of it (though I am certain there must be a reason), but for generations my family has been planting garlic only during ‘mancatura’ – when the moon is waning. Separate the cloves of garlic – no need to remove skins, in fact, try to keep the clove encased in its paper thin covering. Once your bulbs are ready to go, set aside and prep the garden which begins by tilling the soil, adding natural fertilizer (we use only the finest horse poop), till again, and finally dig a trench using a backhoe. 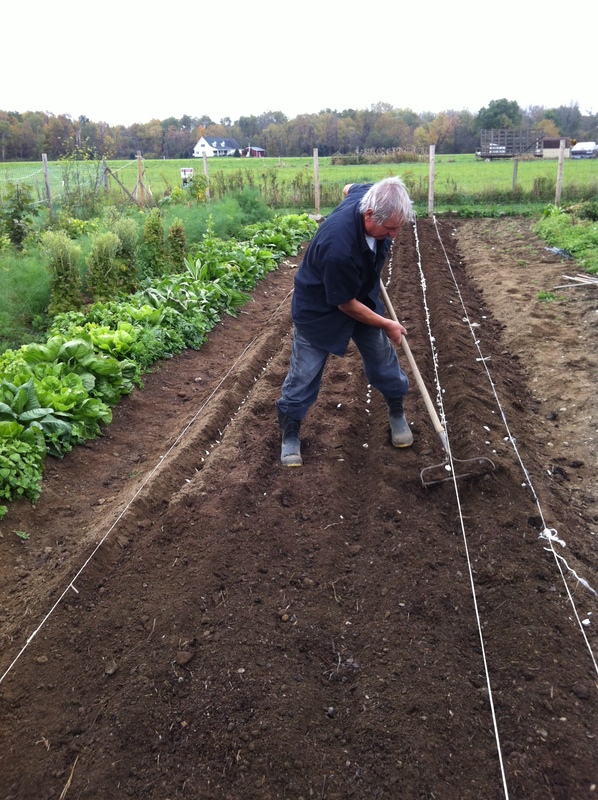 My Father takes care of this – he uses two poles stretched with string to ensure the trench is straight. 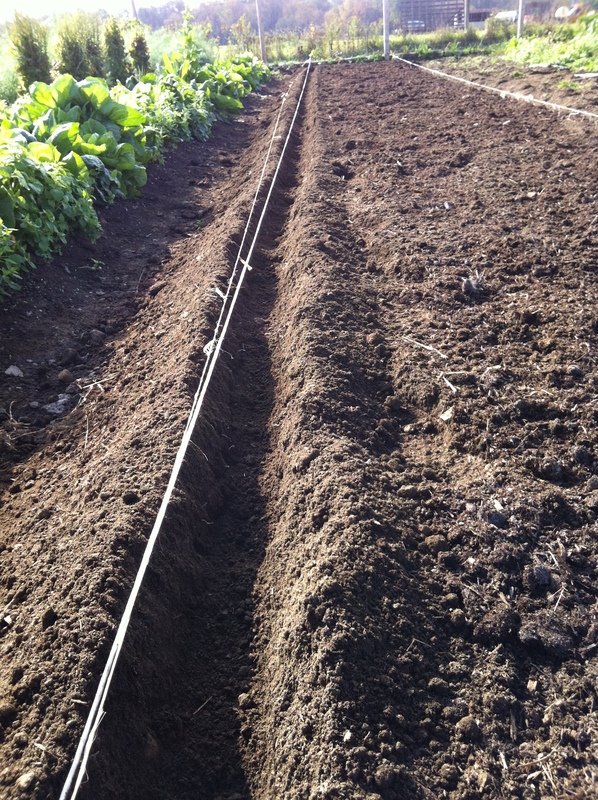 Depending on how many bulbs you plant determines the size of your trench. 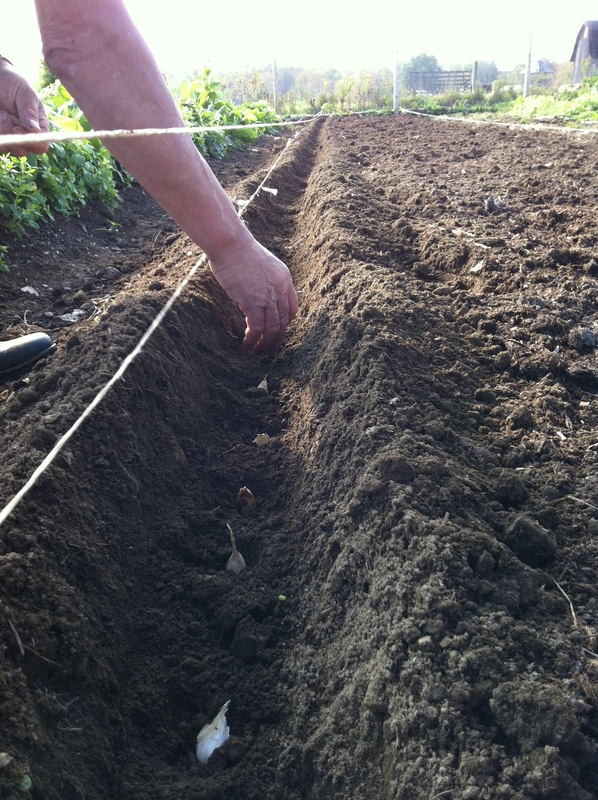 Place each bulb/clove into the ground with the flat/root end into the ground (pointy part on top). Plant the bulbs approximately 2-3 inches apart from one another in a straight line. Once all of your bulbs are planted, gently cover with the dirt removed for the trenches and evenly spread over the bulbs. Be careful while doing so (and while planting) not to step directly over the planted bulbs. There is no need to water after planting, in fact, it is advised not to water. 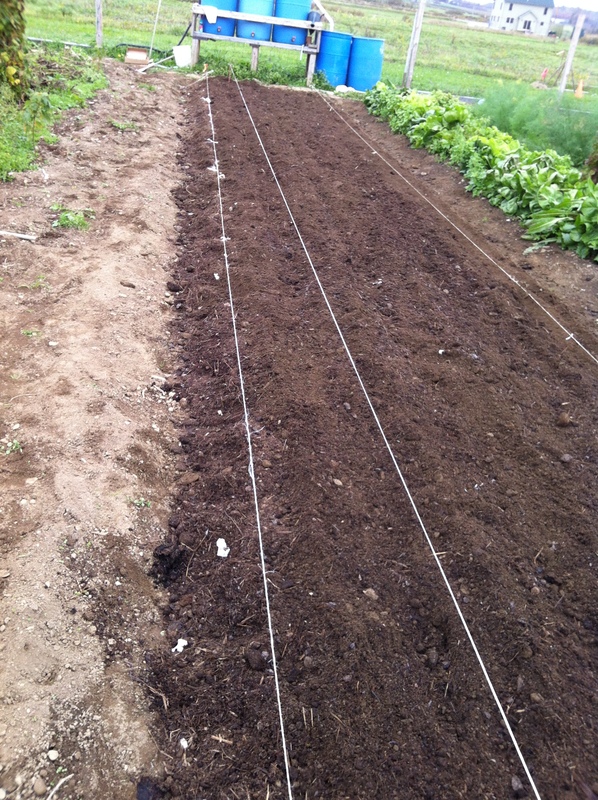 The garlic will begin to sprout and surface before the first snowfall. There is no need to cover them or protect them, this is just what they do. They grow a little after planting, then remain dormant until Spring, which is when they get busy and start growing tall – until finally ready to be plucked in mid-late July. I couldn’t be more grateful to my Father for teaching me all about garlic – at least the planting of it. He’s right off the boot and doesn’t touch the stuff. When my Mom makes meatballs, or anything that would typically require garlic, she makes two versions, one for us, and one for my Dad. Despite not eating it, my amazing Father plants and harvests our garlic crop – he knows how much we love it and selflessly endures the stench (or as I like to think of it, aroma). Prev Post: Orange-ya glad there’s Fennel? Just found your blog! I am so impressed by how much garlic you grow. I also grow as much as I can (which is still not as much as you), braid it and try to make it last throughout the year. We are almost out of last year’s harvest already, but I planted more than usual last year, so I am hoping I will have grown enough to last a whole year this year! 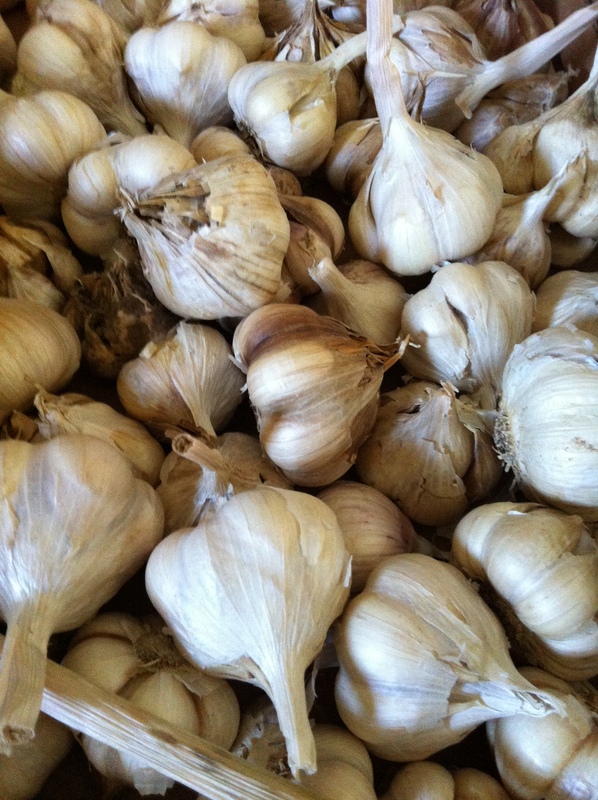 Anyway, great post, from one garlic-growing lover and eater to another! Thanks for stopping by, Lilly – and your comment! Isn’t is so awesome to have homegrown? Needless to say, my family and I LOVE garlic! With the exception of my Dad (pictured in the post) – He hates it, which of course, explains why we typically make two of everything…even meatballs. My parents are from Italy, so he’s quite an anomaly. If you get a chance, check out my post called “Introducing La Bagna Cauda.” It’s a traditional Northern Italian hot dip – and FULL of garlic. So yummy, but definitely not ideal for Valentine’s Day! Best wishes for a successful and bountiful garlic harvest, fellow garlic-growing lover!